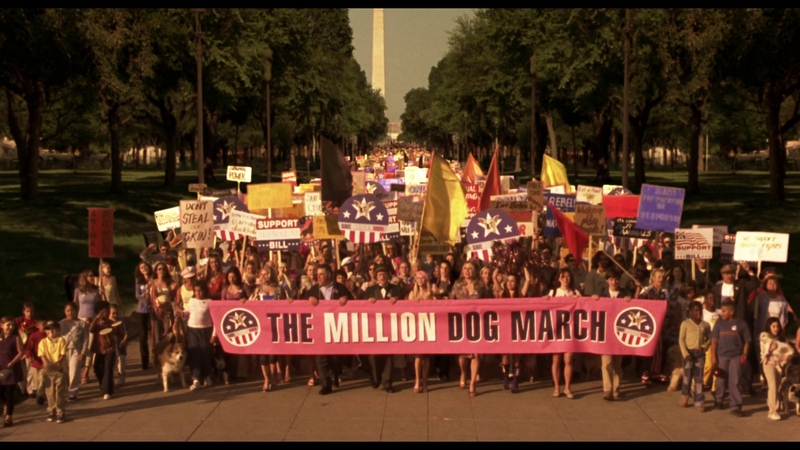 There’s solace in the idea that, post 9/11, in 2003, someone like Elle Woods can march into Washington to bring attention to animal cosmetic testing. 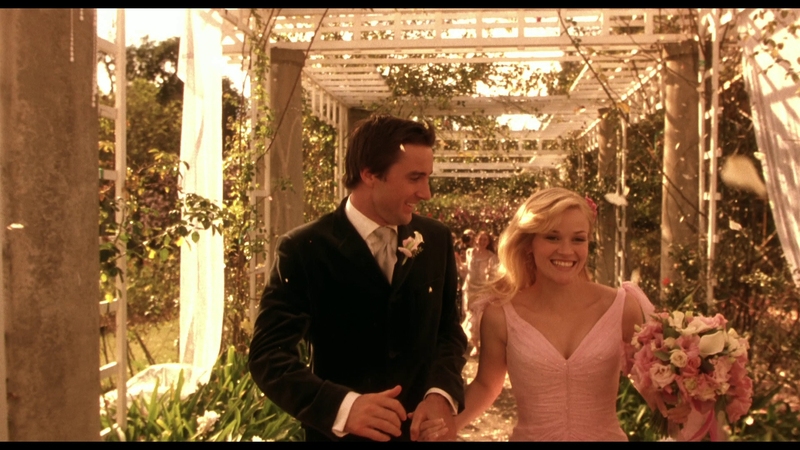 One of Legally Blonde 2’s best shots is that of Woods (Reese Witherspoon) walking on the steps of Congress amid hundreds of black suited men. Woods, dressed in a Jackie O. inspired pink outfit, splits that mass of droll sameness. Personalities can move Washington to any cause. 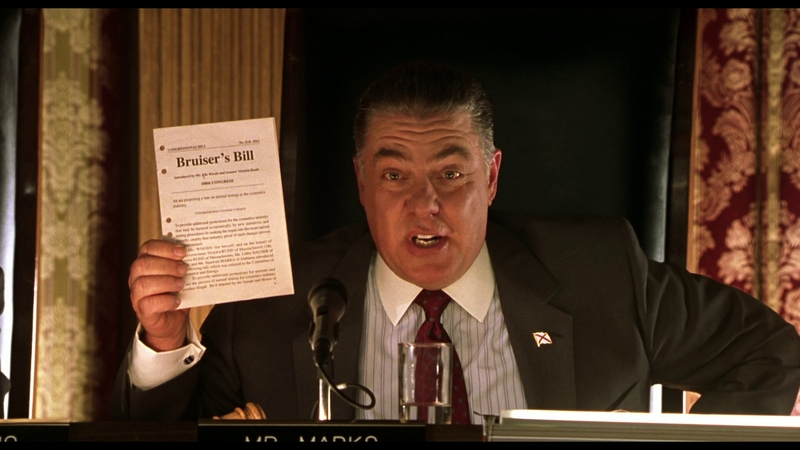 To make its point, Legally Blonde 2 uses clips from Mr. Smith Goes to Washington and a snippet from a remake of the Vietnam era’s hit “For What It’s Worth.” That’s taking things a touch far. Like Woods, this sequel has a heart planted where it needs to. But, it’s not those things it wishes to be. Again, consider the period. Two years after an attack on American soil and a reignited Middle Eastern conflict, here comes someone not yet impacted by the process of politics. Those around her stare with cynical looks and general disdain for the city’s processes. Everyone looks burned out. 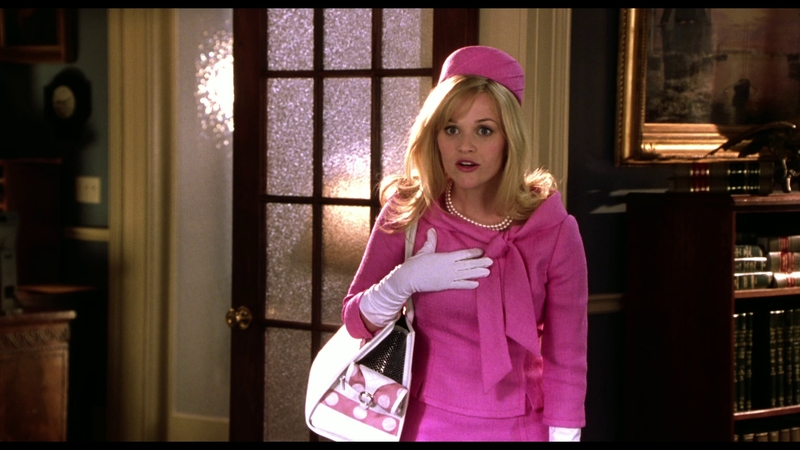 In steps Elle Woods, fashionista fired from her law firm, to talk about dogs. 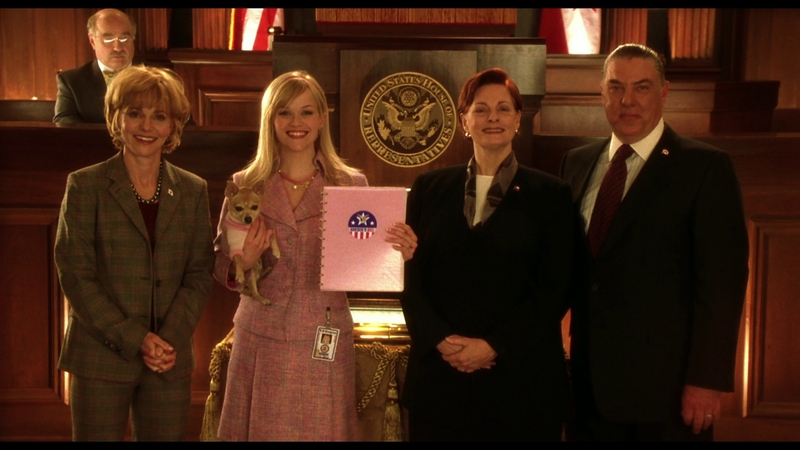 But by the time Legally Blonde 2 is staging a protest cheer (with outfits and pom-poms) in the House of Representatives, there’s no real hope of recovering, the endearing optimism of Woods or not. Legally Blonde 2 makes the miscalculation of turning Woods ditzy, clueless, and not adorably so, but embarrassing. She tries making friends of new political co-workers by way of anonymous notes pulled from a bedazzled cup. Ouch. That doesn’t even touch the subplot of a Republican NRA supporter who discovers his dog is gay and finds his own soul as a result. This is a bizarre movie. Legally Blonde 2 is excited to try, at least. Woods still sees the best in everyone and everything. Her dorky friends return, Jennifer Coolidge in an expanded role while sidekicks Alannda Ubach and Jessica Cauffiel seem hastily written in. Their comedy is grating. There’s not an ounce of sincerity to take away from this sequel. Issues of sexism and workplace harassment that glanced the script of Legally Blonde drift to the unknown. Here, there’s a wedding to plan for, in-between chasing down Congressmen. It’s inherently phony, but not with the same shtick of before. Elle was an anomaly. 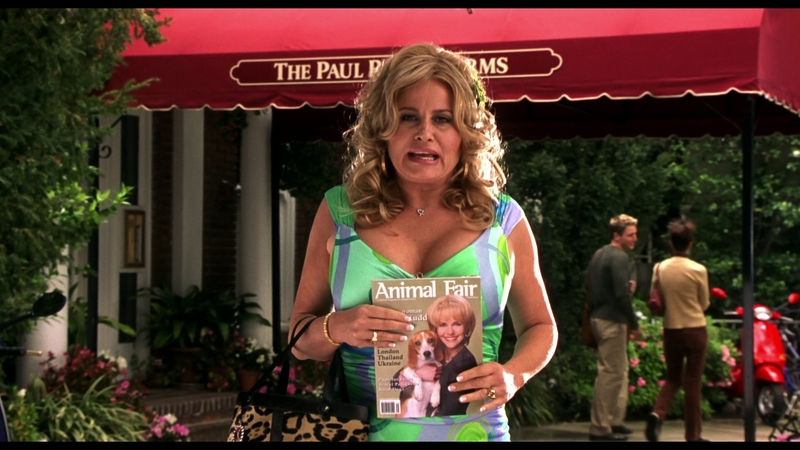 Now, all those around Elle feel equally artificial, especially Sally Field as Legally Blonde 2’s closest thing to a villain. Legally Blonde 2 doesn’t inspire one to action, rather suggesting the way to create change is fantasy. 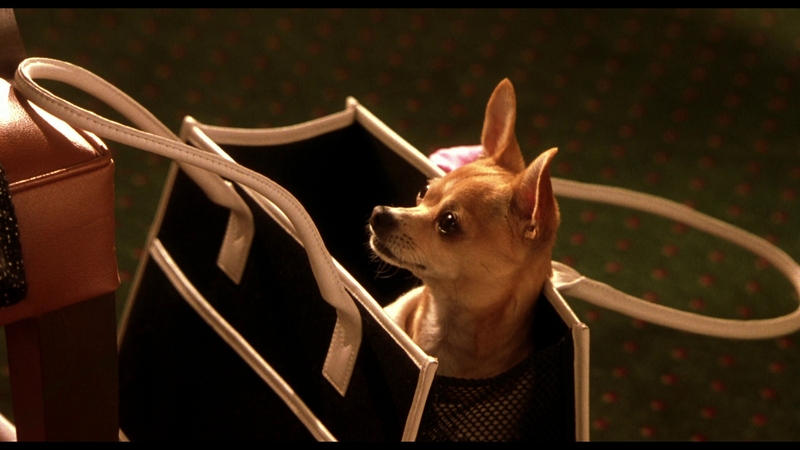 Shout does not remaster the sequel, included in the same package as the first Legally Blonde. Instead, this looks like an old, even dirty master with specks and dust littering the screen on occasion. Sour resolution produces limited or no detail at all. A weird grain structure appears to hover over the image rather than be part of it. It’s like looking at Legally Blonde 2 through a glass texture. That only adds to the issues. At least the color protrudes with a vibrant selection of outfits and lots (lots!) of pink. 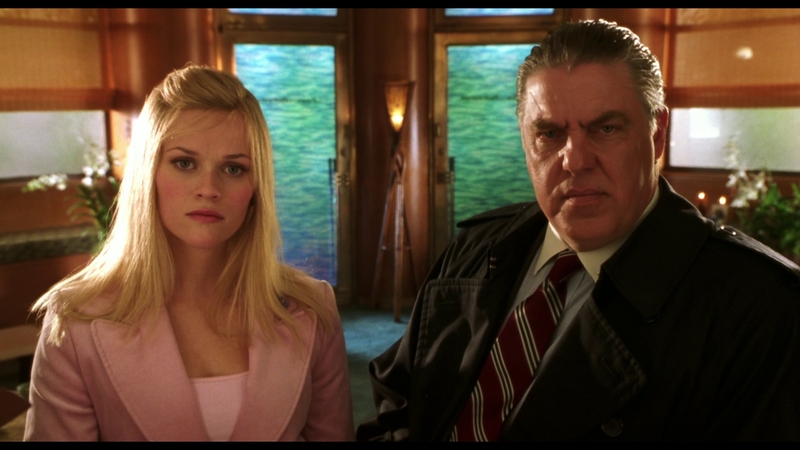 Short of the Congressional chambers where lighting warmth takes over, Legally Blonde 2 pushes a slew of saturation from a wide array of primaries, all with a slight warm tint to make things comfortable. Contrast goes too far, hindered by heavy clipping that robs the screen of potential detail. 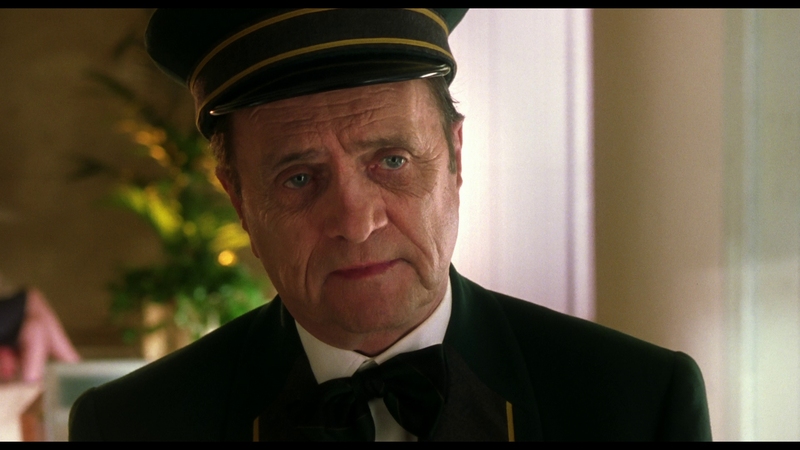 Certainly, cinematography aims for a bright aesthetic, but the haze of it all impinges things. Lighting creates blobs of white. That isn’t attractive. DTS-HD comes in 5.1 and 2.0. The stereo track limits things, although the 5.1 is understandably droll too. Voices work into the stereos a few times, while speeches indoors spread the soundstage.It’s a pleasing echo. A number of crowd scenes fill the rears too, while the soundtrack adds a marginal kick to the low-end. While likely untouched in terms of new mastering, dialog clarity is fine. There’s no problem of balance. Shout interviews Jessica Cauffiel for eight minutes about her time on the sequel. That’s new. The rest comes from the previous release, beginning with a commentary that brings Cauffiel, Alana Ubach, and Jennifer Coolidge together. A nice little making-of runs 22-minutes titled Blonde Ambition. Both Witherspoon’s hair and dress earn separate seven minute featurettes. Pretty in Pink looks at production design (with a brief mention of a possible TV series spin-off) and the score comes into focus with Elle’s Anthem. A small gag reel and deleted scenes join a LeeAnn Rimes music video and trailer as the closing components. 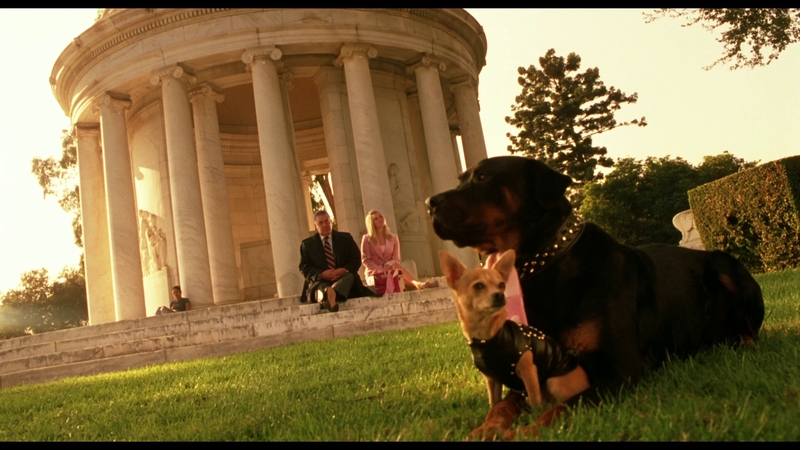 No amount of heart can salvage Legally Blonde 2 from a place in the graveyard of buried, forgotten sequels. The 15 unaltered images below represent the Blu-ray. For an additional 20 Legally Blonde 2 screenshots, early access to all screens (plus the 20,000+ already in our library), 75+ exclusive 4K UHD reviews, and more, support us on Patreon.